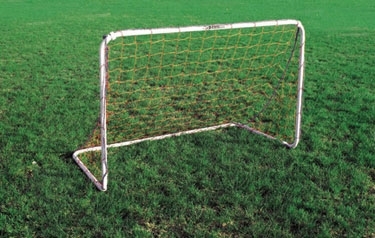 Our KwikGoal Project Strikeforce Soccer Goal 4'x6', is 1 1/2 round Metal tubing construction, Kwik button assembly for easy setup & portability, with a finish of powder coated white. KwikGoal Lifetime Guarantee. Quality Features: * 4' H x 6' W x 0'D x 3'B * 1.5" O.D. metal * Powder-coated white finish * Kwik Button® assembly, KwikGoal Lifetime Guarantee.